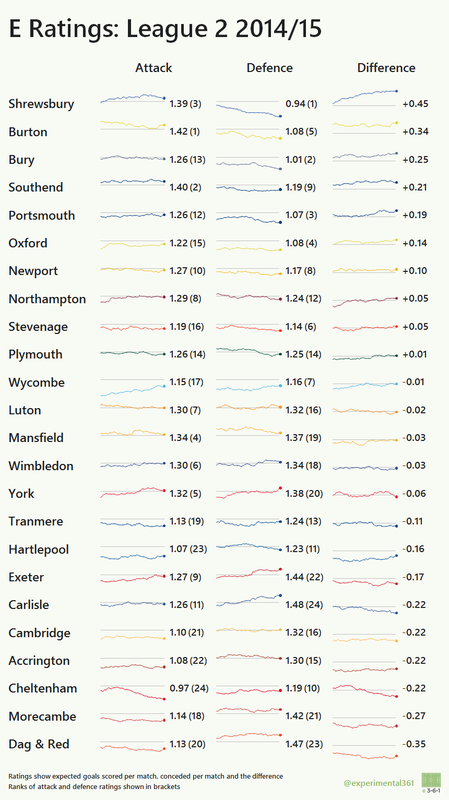 It’s reassuring that the four best-performing clubs by this measure were the ones who got promoted, but it was a different story at the bottom, with Morecambe and Dagenham & Redbridge appearing fortunate to have survived. Cheltenham‘s relegation seems to have been due to a lack of cutting edge up front, with their attack rating deteriorating significantly over the season while their defence actually performed better than average at restricting their opponents’ chances. 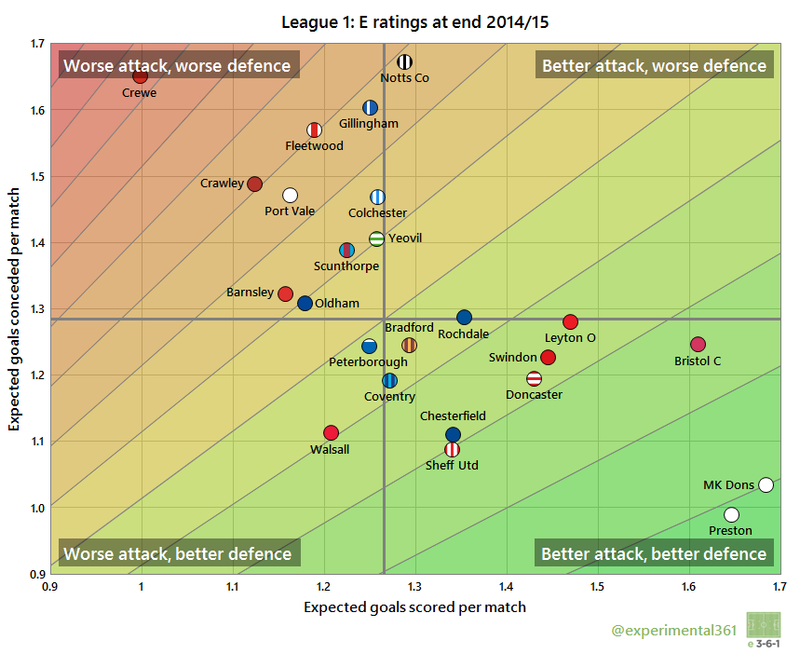 Wycombe provide a useful lesson in the application and limitations of these ratings. A dire 2013/14 campaign in which they scored just 1 goal per match and were nearly relegated meant that they started last season with a very poor attack rating. A much stronger showing saw their rating increase significantly over 2014/15, suggesting that it takes these ratings a while to “catch up” when a team’s ability changes a lot between seasons. It got there in the end though: if you add up the expected goals from every club’s shots last season Wycombe rank 16th, while their attack ended up 17th when using E ratings. Shrewsbury‘s promotion appears well-deserved, with Southend and Burton‘s strong attacking performances also visible. 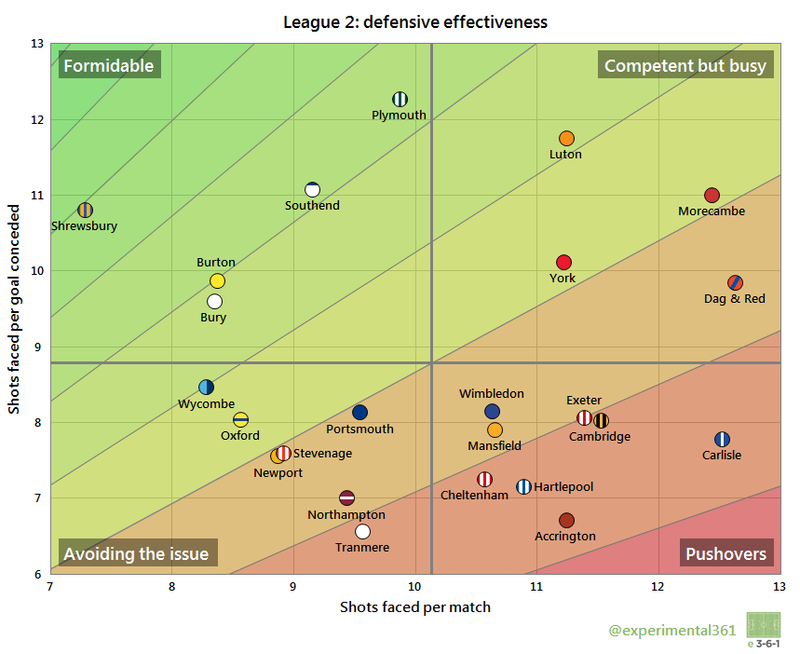 Plymouth‘s play-off finish is a bit surprising given their almost bang-average ratings at both ends – it looks like their defensive resilience gave them the edge.